Why Is Sludge Blending Important? 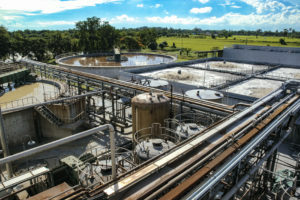 For many industrial wastewater treatment facilities, sludge accounts for as much as 30-40% of capital costs and about 50% of the operating costs due to the complex nature of processes involved to curb by-product waste. The sludge or “bio solids” left over can be refined into nitrate based fertilizers/ compost, chemical bio-fuels or other natural resources. Sludge biosolids can also be further dewatered for post processing and disposal purposes and because of the many products that can be economically produced; the sludge process is a true bio-refinery. Many water treatment plants focus on improved quality within their operations of sludge handling and mixing equipment selection. Sludge viscosities have an influence on e.g. pumping, hydrodynamics, mass transfer rates, sludge–water separation (settling and filtration). In fact, rheological behaviour of sludge is a consideration in process designs and model selection criteria, qualitative parameter estimations and proper model validation of sludge treatment systems. When we discuss rheological behaviour, we are referring to viscosity, shear rate, and shear stress. Biological nutrient removal (BNR) or activated sludge systems produce waste activated sludge (WAS) that is rich in nitrogen and phosphorus. The sludge collected from primary and secondary clarifiers is treated and dewatered through a series of steps, e.g., anaerobic and anoxic sludge tanks, sludge holding tank, centrifuge and belt filter press or dewatering tanks which is then dried and disposed. Mixers are commonly used in aerobic-anaerobic and anoxic sludge treatment to increase process efficiency and to meet bioorganic throughput specifications. For example, mixers promote thermal fluid movement and prevent hydraulic dead zones that affect reaction kinetics involved in anaerobic digestion – inactive mixing zones in digesters can easily lead to digester failure. Anoxic denitrification removes nitrogen from wastewater and comes after nitrification through aerobic zones whereas anaerobic digestion removes phosphorus from sludge. This is also known as enhanced biological phosphorus removal (EBPR). Mixers are used in suspended growth anoxic denitrification processes and are common in anoxic tank reactors. Nitrate is used as an electron acceptor in energy metabolism. Through bacterial (microorganisms) action, bacteria first reduce nitrate to nitrite and then to nitrogen, which is released as inert nitrogen gas. Gasses produced are passed through an activated carbon filter or bio-filter for odor control. MBBR (Moving bed biofilm reactor) reactors can be used and are ideal for both aerobic and anoxic processes and are utilized with mechanical mixers for circulation in anoxic reactors for efficient nitrogen release. 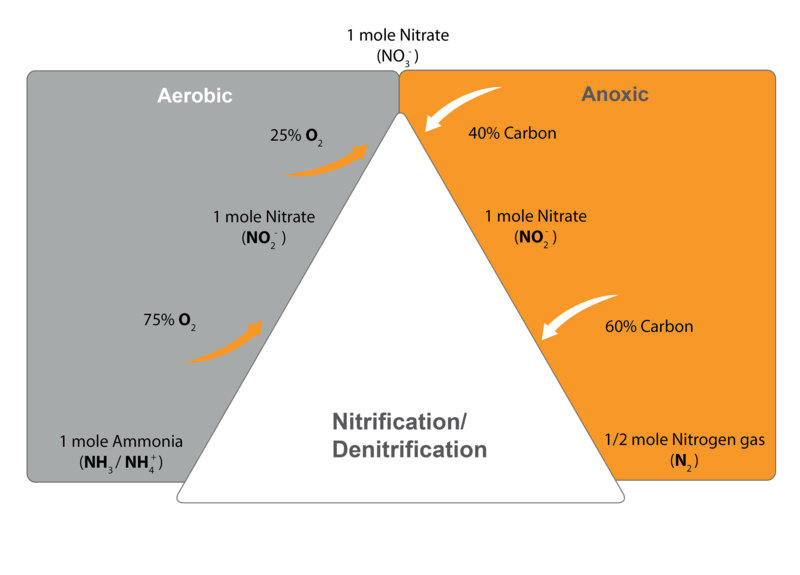 The simple distinction between anaerobic and anoxic conditions in wastewater practices is that anoxic means there is an absence of free oxygen (O2), but presence of bound oxygen (NO2, NO3) while anaerobic conditions have a total absence of free oxygen (O2) or bound oxygen (NO2, NO3) such as oxidized nitrogen species. Anoxic digestion use top entry/ side entry agitators to maintain the activated sludge, which encourages the right biological communities to form resulting in an anoxic condition suitable for denitrification. This is a delicate application that requires low shear mixing for uniformity but it cannot introduce unwanted air into the process or foaming – the process is generally a closed system so mixers should be designed to minimize oxygen absorption from the atmosphere with a combination of properly sized tank mounts and specialized mechanical seals that prevent leakage of gas from the digester. Also mixers with lower rpm and low horsepower should be considered rather than high speed high shear options which can cause foaming and introduction of excessive dissolved oxygen (0.4 mg/L) above the required minimum to maintain an ideal environment. A methodical mixer design can help maintain physical, chemical & biological uniformity, maintain optimum conditions for nutrient removal, utilize the digester volume effectively and prevent stratification and temperature gradients within the tank. Placement of tank outlets and inlets are also very important. Aerobic digestion allows aerobic bacteria to rapidly consume organic matter and convert it into carbon dioxide (CO2) that stabilizes waste-activated sludge without primary settling tanks and reduces the solid concentration in the sludge. Mixers together with surface aerators, especially in deeper tanks, can improve oxygen transfer and process result due to better contact between sludge and wastewater as well as provide better off-bottom solids transport. Well-mixed digesters also tend to produce more digester gas which in turn means greater VS destruction and less bio solids to dewater and more nitrates are produced. This reduces the operational cost of the dewatering facility and the hauling and disposal costs. Anaerobic digestion takes much longer and is a more complex chemical and organic process where raw sludge is biochemically digested into carbon dioxide (CO2) and methane (CH4) by the anaerobic microorganisms. Digestion typically begins with bacterial hydrolysis that breaks down insoluble organic polymers such as carbohydrates with the end result being the conversion of organic waste into methane and carbon dioxide. Activated sludge or zones are important as they are used to provide improved settling and thickening characteristics for sludge dewatering stages. 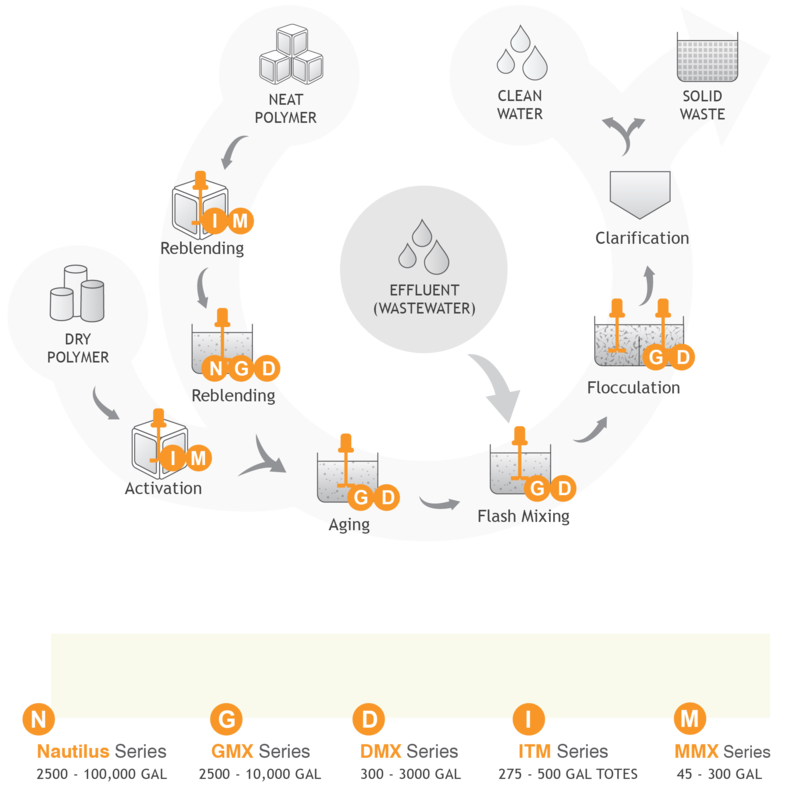 Thickening can be accomplished by physical means including co-settling, gravity settling, dissolved air flotation (DAF), centrifugation, gravity belt, and rotary drums. For sludge dewatering, mixers can reduce flocculant consumption and/or increase the dry solids content of the dewatered sludge. Smaller quantities of air per tank volume are required since the function of keeping the sludge in suspension is guaranteed by using a mixer. For example, if chemical conditioning is being applied to sludge, mixers can ensure quality control for chemical dosing of organic polymers or inorganic chemicals. Ultimately, particle size is the most important characteristic of the dewaterability of sludge as it is passed downstream. With mixing, we treat sludge as a shear thinning application – Pseudo-plastic application. This is where this application deviates from a typical Solid Suspension which we can address more objectively (i.e., calculating settling rate and suspension). The reason for this is that mixing of shear-thickening fluids can bring about an effect that is nearly the opposite of cavern formation by yield stress fluids. Shear-thickening fluids increase their viscosity essentially solidifying near the high-energy impeller zone becoming a dilatant fluid with no control. For high concentrated sludges, rheological behavior is non-Newtonian because shear stress is not linearly proportional to the shear rate. That’s why conservative sizing estimates are made giving primary consideration to the pumping capacities required for blending and pumping capacities required for solid suspensions requiring that calculations of an effective impeller diameter increase and that absence of baffles can increase power consumption by a significant factor. To adjust mixing intensity and retention time mixers can be equipped with a variable speed drive, configurable impellers designed to optimize glide ratio, lowest power usage with the highest pumping capacity and lowest shear. Request a free quote by filling in an online form or call us at 604-670-6964 for all other inquiries about our agitators and mixers. Dynamix offers a good price, great support, and excellent service. The DMX 5000 Series mixers perform well and are easy to install and maintain.